The US has vetoed a UN Security Council resolution condemning an Israeli attack in Gaza that killed 18 civilians, including women and children. The draft, which also condemned Israeli military operations in Gaza, followed Wednesday's attack in Beit Hanoun. The US ambassador at the UN, John Bolton, described the text as unbalanced and politically motivated. Ten of 15 Security Council members backed the resolution. Four abstained - Denmark, Japan, Slovakia and the UK. This was the second time this year the US used its veto on a draft resolution on Israeli military operations in Gaza. The US has a history of vetoing resolutions condemning Israel which it feels are biased against the country, says the BBC's Laura Trevelyan at the UN in New York. The draft resolution - backed by Arab, Islamic and non-aligned states and formally proposed by Qatar - called for a withdrawal of Israeli troops from the Gaza Strip. It also asked the UN secretary general to set up a fact-finding mission into the deaths in Beit Hanoun. 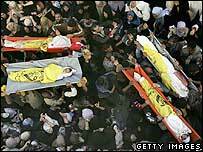 The draft urged the Palestinian Authority to act to end violence - including rockets fired at southern Israel. The US ambassador said he regretted the Palestinian loss of life, but disagreed with the language used in the resolution. "This resolution does not display an even-handed characterisation of the recent events in Gaza, nor does it advance the cause of Israeli-Palestinian peace to which we aspire and for which we are working assiduously," he said. An Israeli government spokesman described the veto as "very satisfactory". "The draft resolution did not stipulate that what happened at Beit Hanun was a tragic error," Avi Pazner told AFP news agency. But Palestinian cabinet spokesman Ghazi Hamad of Hamas told Reuters the veto was "a signal that the US had given legitimacy to the massacres and a green light to [Israel] to ... carry out more massacres". Qatar's ambassador said the credibility of the Security Council had been called into question by the vote and the cycle of violence in the Middle East would continue. The deaths were caused when what witnesses described as a volley of tank shells hit a built-up civilian area. Many of the dead were from one extended family, and included several women and children. Israeli Prime Minister Ehud Olmert apologised for the attack, describing it as a "technical failure".